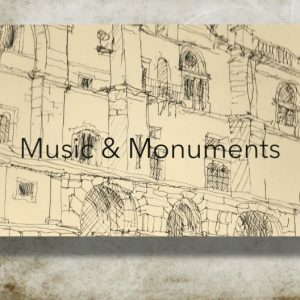 This project started as an idea to link music and historic Portuguese monuments by using digital imagery, collage, paint and photo transfer. The first part of the project involved working on 30x30cm canvases. 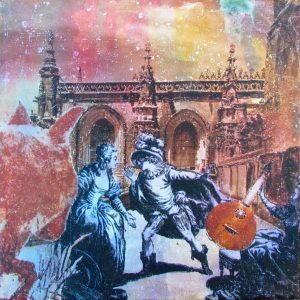 I digitally blended my artworks with images from the internet and afterwards added collage and paint on the canvas. The digital photo in each case was the key to the piece. 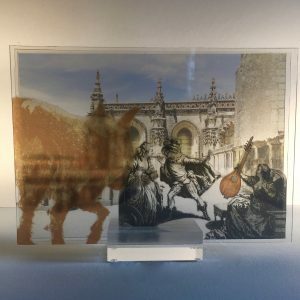 I transferred the printed digital images manually by removing the paper from the photos, gluing the transparent films and working with collage and other media. Click on an image below to see more in a series.